Welcome back to the Cabins! I had so much fun with the Down on the Farm quilt on the September 26th Bake Shop, that I just had to return with a couple of “minis” for everyone. The gorgeous Midwinter Reds fabric line from Minick and Simpson is just perfect for building log cabins, so I am going to continue the theme here.The table topper size quilt is going to look amazing for my Christmas decorating and the little mini is a show stopper at any time of the year and will be showcased in a prominent spot in my quilting studio. Barn board frame to finish off your masterpiece. The blocks shown above are for your reference during the construction process. If you are using a planned colour placement for your blocks you could cut your strips and label them as to the placement number as shown in the block above on the right. If you are making your block scrappy, just be sure to follow the light side for your lights and the dark side for your darks. Now it’s time to open up that gorgeous layer cake and make a few decisions. Do a quick flip through all of those fantastic prints and separate the reds into one stack, the creams into one stack, the tans into another stack and a separate stack for the prints that you don’t think will work in your layout. 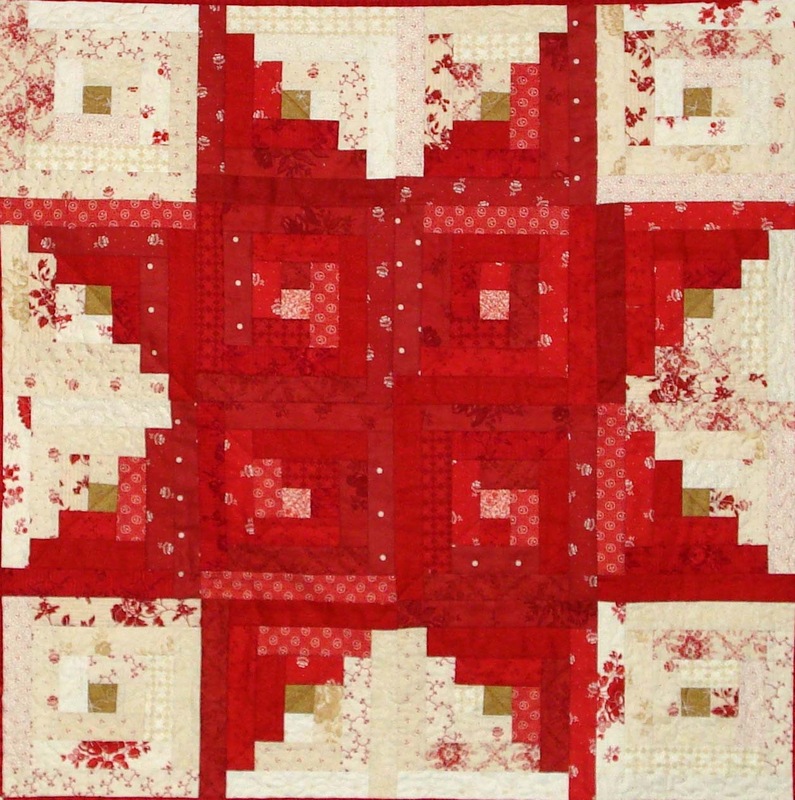 To get the star effect you will be making the following:4 – all cream blocks (avoid prints that have too much red); 4 – all red blocks (avoid prints that have too much cream or tan in them); 8 – 1/2 red and 1/2 cream blocks. As a color guide see the reference block above.Now have a look at your four paper pieced log cabins and decide which prints you want to use for them. 1 1/4” is the widest strips that you need for the cabin and the roof units; a 2 1/4” piece is needed for the window. If you are using a print that has not been used in the 16 log cabin blocks then there is no concern as to whether you will have enough. 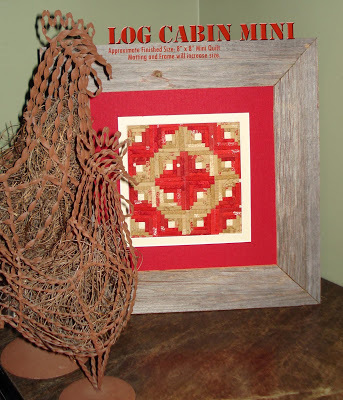 If you are using some prints from the log cabin blocks, then just make sure that you set aside some for your paper pieced cabins. Or you can make your four paper pieced log cabins before starting the 16 blocks and eliminate the “surprise” factor. 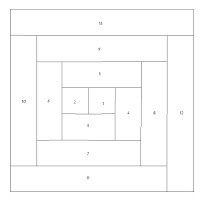 Make a stack of 4 to 6 prints from the 10″ x 10″ squares that you have selected for your log cabin squares (or whatever number you are comfortable cutting through at one time). Line up the left hand edges of your stack as close to perfect as possible. Measure 1 5/8” from the left raw edge and make your first cut. Flip the strip around and trim off the raw edge to make a perfect 1½” strip. From the light strips cut 4 – 1½” strips from each print and from the dark prints, cut 5 – 1½” strips – all your strips will be 10” long – do not cut into shorter segments at this stage. If you prefer, cut one strip less of each of the prints and then just go back later in the construction process and cut a few of the prints that you feel you want to have a bit more of. Using the yardage that you have chosen for your centre squares, cut 1 – 1½” x 42” strip and sub-cut into 16 – 1½” squares.Before you start sewing – check your seam allowance. A perfect 1/4” is preferred, but in all cases ensure that whatever seam allowance you start with you continue through the entire quilt construction process. To achieve the 7” finished square blocks for this project, I needed to move my needle setting over to the right by a couple of nudges. Everyone’s machine may sew just a bit different and everyone’s presser foot might be a bit different, so be prepared to maybe have a 7” x 7” finished block, and maybe not. Step One: Place a centre square and a light strip right sides together and join with a 1/4” seam, using the machine’s presser foot as a guide. Now line up your ruler against the straight edge of Print #1, and using your rotary cutter trim away the excess of Print #2 (refer to the block legend shown earlier for reference). Open squares and press seam allowance away from the centre square. NOTE: Remember that the last strip you added is always on top under the needle. Sew with the wrong side of the finished work facing you, the new strip will always be underneath so that you can see the seam allowances and guide them away from the centre of the block as you stitch. Step Two: Lay this unit on top of another light strip – right sides together. Stitch this seam as shown in the photo. Ensure that you push the seam allowance up as you sew over it. Trim off piece #3 evenly with piece #1. 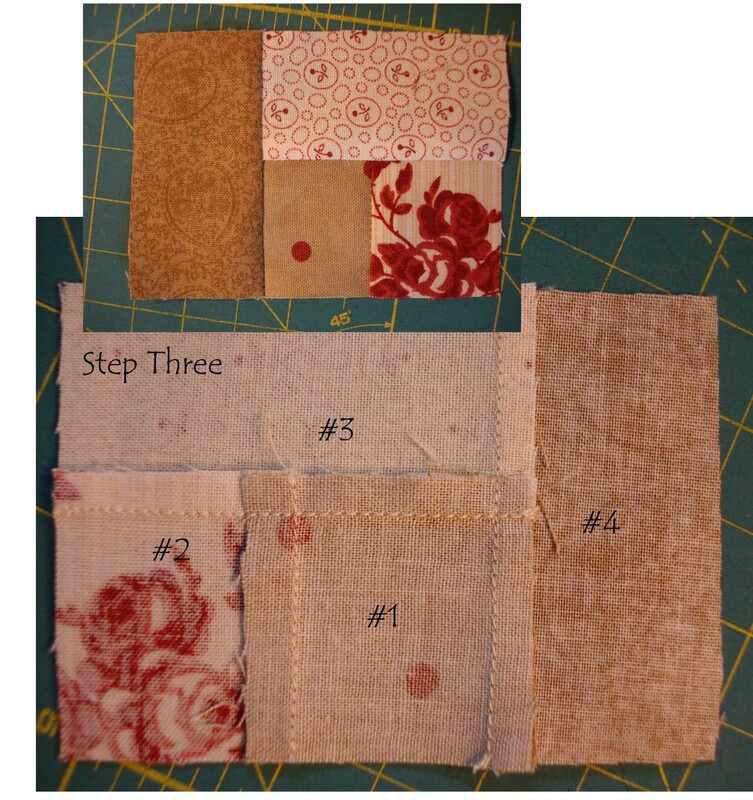 Press seam allowance away from the centre square. Step Three: Turn the unit so that piece #3 is at the top and lay this section over a dark strip (#4). Align the raw edges and stitch, ensuring that the previous seam allowance is pushed upwards. Trim unit evenly with piece #1 and #2. 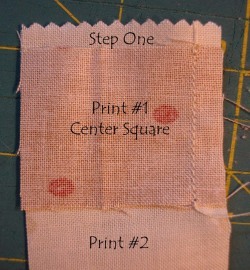 Press seam allowance away from the centre square. Step Four: Now lay this partial block on top of another dark strip (#5). Stitch and trim strip #5 even with the edge of unit #2 and #3. Open up and press. Continue adding and trimming strips in this manner, always turning the block counter-clockwise as you add strips, until you have a block 7 1/2” x 7 1/2” square that looks like the block above. Assembly line piecing works very well with this type of block if a planned colour placement is used. As in the samples shown here, the prints are randomly placed which makes it a bit more difficult to use the assembly line method – a modified version does work, but not quite as efficiently. 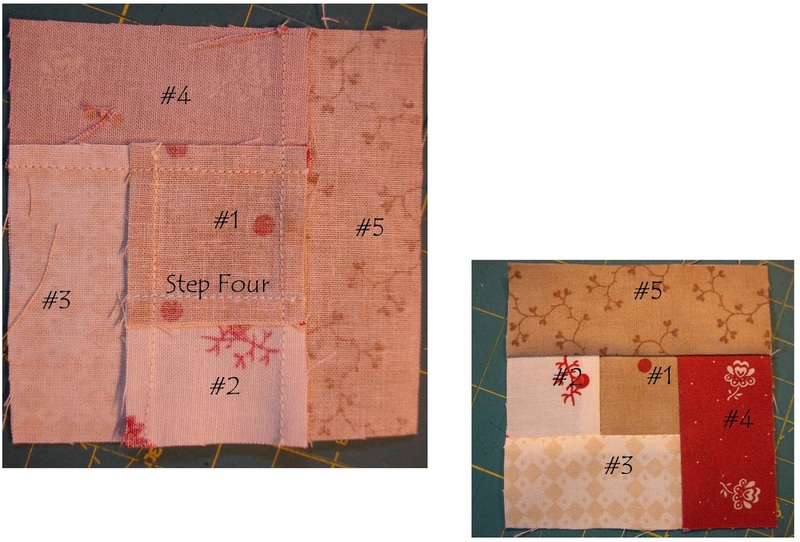 Give all of your blocks a final pressing and get them stacked and ready to lay out into a quilt. Refer to the photo below or play around with different layouts to find one that appeals to you. If you have some leftovers from the Log Cabin Blocks (1 1/2”), these can be used for: House Roof; House Door; and Chimney, or cut 1 1/2” strips from your chosen prints. For the House Window cut a 2” strip from remaining 10” x 10“ fabrics – they can all be the same or different – your choice! From your background fabric (42” wide) cut two 1 1/2” strips and one 2 1/2” strip. The 2 1/2″ strip is needed for the left side of the roof unit and the top of the block. Add a 1 1/2” background strip to each side of the cabin once it is constructed and a 2 1/2” strip to the top of the cabin block. 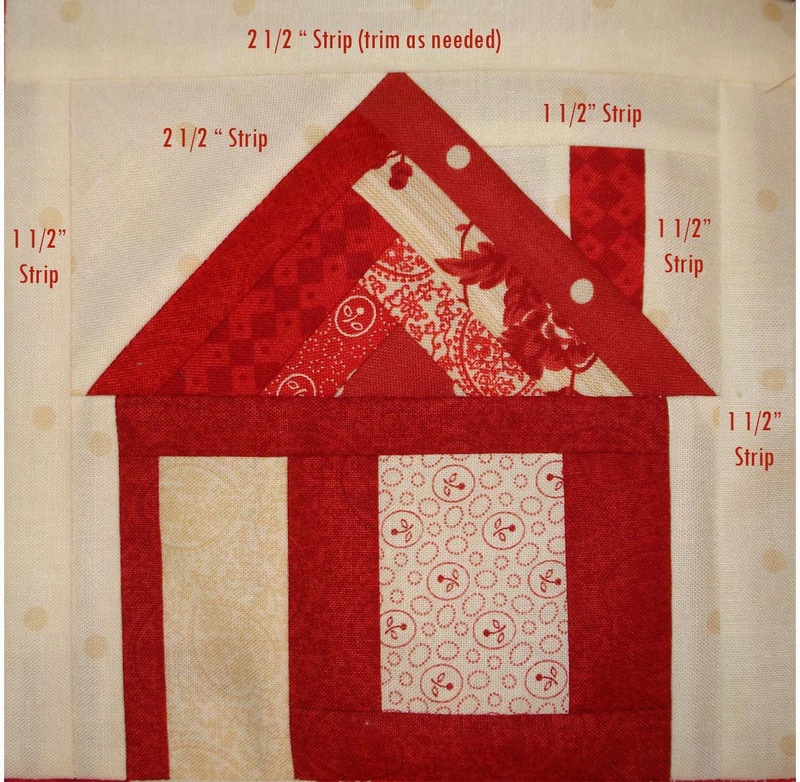 If you need to adjust the log cabin blocks to fit your border when it is completed, the 2 1/2″ strip across the top is where you can add a bit to or subtract a bit from, so you may want to leave this strip off until you finish your border strip set (see instructions below). Trim it to match your border right before sewing it to either end. The borders for this quilt are done in strip sets. 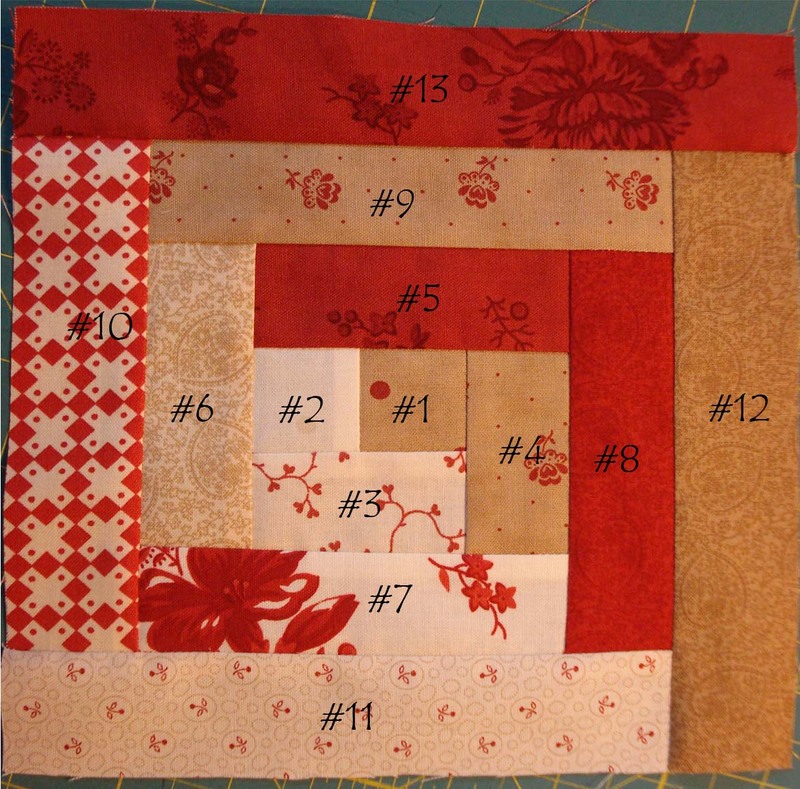 Measure the four sides of the quilt top, and mark down the most consistent measurement. From your first border print cut four (4) 1 1/2” strips of your recorded measurement. From your second border print cut four (4) 2” strips of your recorded measurement. From your third border print cut four (4) 4” strips of your recorded measurement. Sew the first and second border strips together, matching at either end. Press the seam to the darker print. Repeat for the other three sides of the quilt. 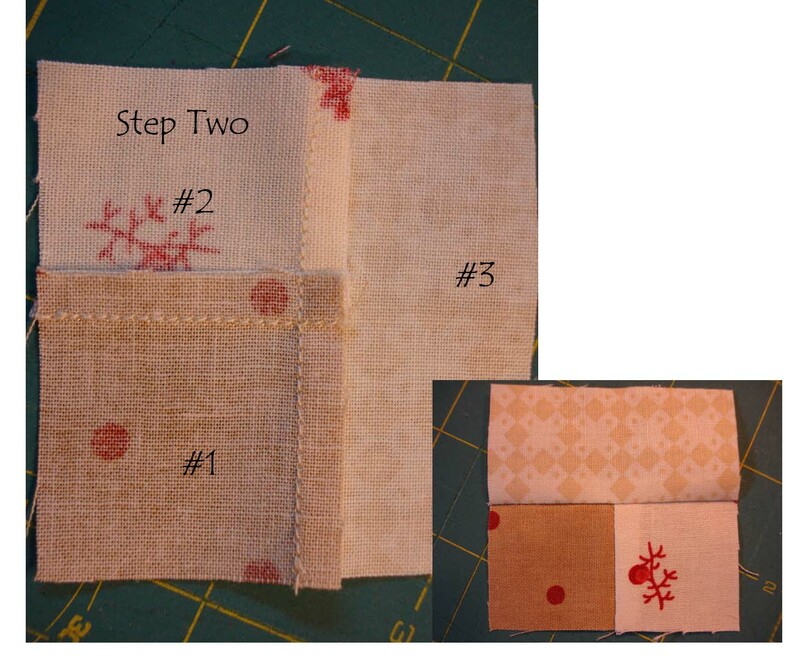 Sew the third border strip to the second border strip, matching at either end. Press the seam to the darker print. Repeat for the other three sides of the quilt. Sew a border strip set to two opposite sides of the quilt top, matching at either end (pin at intervals along the entire length). Press seam towards the border. Sew a paper pieced cabin block to either end of the remaining two border strip sets. Pin this border unit, right sides together and matching seams at borders, sew the final two borders in place to complete the quilt top. Final pressing: Your quilt top is now done and ready for one final pressing before being layered and basted for quilting. Binding: Measure the top, bottom and sides of your quilt and divide this number by 42” (width of fabric) and using the number you get, round up to the nearest whole number. This is the number of 2 1/4” strips you need to cut for binding strips. Using a diagonal seam, stitch these strips into a long continuous unit. Press strip in half with wrong sides together. Stitch to the right side of the quilt aligning raw edges as you go and mitering corners as you come to them. Turn edge over to the back side of the quilt and hand stitch in place. 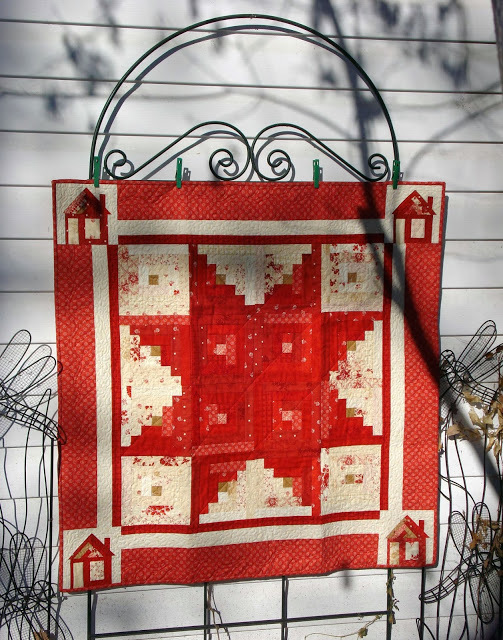 This tiny quilt is also made using 16 log cabin blocks. Make two copies of the attached pattern sheet. Leftovers from the larger quilt can be used to construct this little mini. If you need to cut strips as well, you can cut these into 1” widths. Following your favourite method of paper piecing, construct the 16 log cabin blocks. If paper piecing is new to you, do some research on-line for some of the different techniques and give each a try to see which method you prefer. Reduce your stitch length to a smaller one than you usually use. Trim each seam to less than 1/4” so that it fits into the strip width of the block. Be sure to always clip your threads – you don’t want to be dealing with those when working with such a tiny project. When cutting your blocks apart on the pattern sheet be sure to leave extra paper around the dashed lines – this makes it easier to hang onto and reminds you to make sure that the fabric is wide enough to go past the seam lines on the pattern.5. Pressing as you go is not necessary. The project is small enough that a quick finger press is all that is required. If you do use your iron, remember to PRESS the blocks – do not iron them from side to side. A final press once the blocks are completed is recommended before trimming. This is where the extra paper and fabric that you left beyond the cutting lines now becomes a factor. Each block can now be trimmed by cutting directly on the cutting line (dashed lines) and each block will be the exact same size. 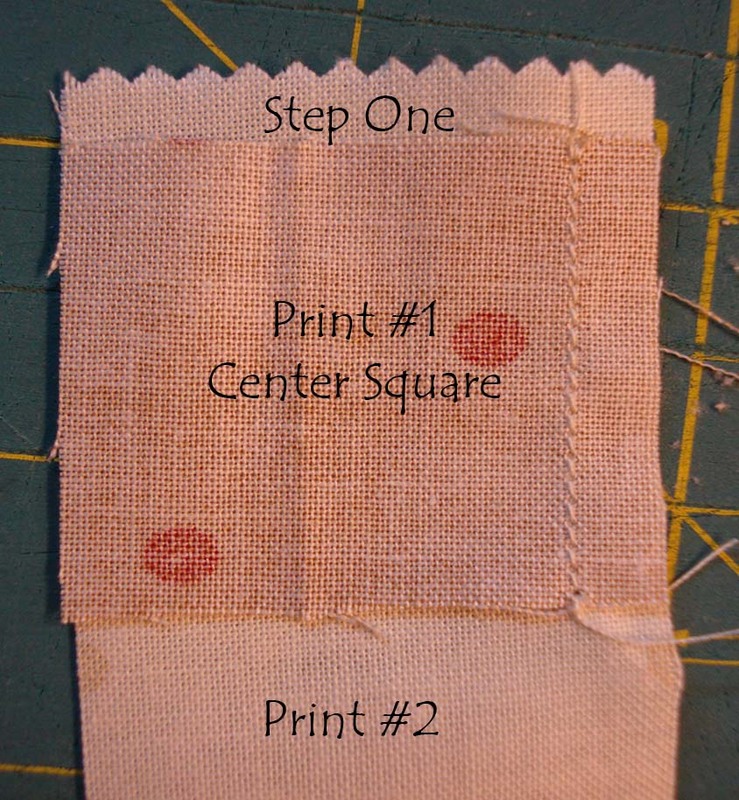 This is important when sewing the tiny blocks together – all you should have to do is line up the paper edges of each of the two blocks being sewn together (right sides together), hold them tight together and sew directly on the seam line. There really isn’t a lot of room on these little blocks for pins, so I find this is a critical step in the construction of the quilt. 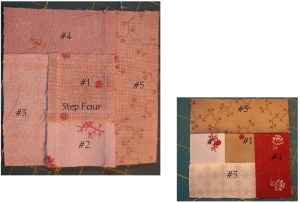 There are a number of ways that you can lay out your little quilt and it is fun to play around with the blocks to see which design you prefer. If you have a camera take shots of each of the layouts and then see which one you prefer. Sew the blocks together into rows. 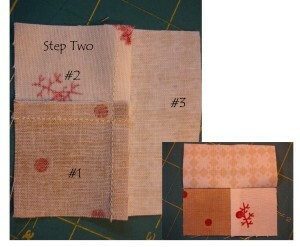 You can remove the paper from the sewn seams only if you want to remove a bit of bulk before you sew the rows together. You can also press the seams open to make things lay a little flatter – there is a bit of bulk in a tiny quilt like this!!! I took my mini-quilt to a frame shop and chose mats that worked best with the tones in my quilt. They had me add a wide enough border to all four sides of the quilt so that it could be stretched around a backing board (foam core or some other firm surface) that would fit into the frame I had chosen. Once again a little research on-line can also yield some wonderful ideas for finishing your mini. The little quilt should measure approximately 8” x 8” when done, so that would be the measurement of the mat opening – you would then be able to choose to have a 10” x 10” frame or a 12” x 12”, with the gorgeous little masterpiece centred and on display. Working in miniature is a challenge but well worth the effort. Have fun!!! 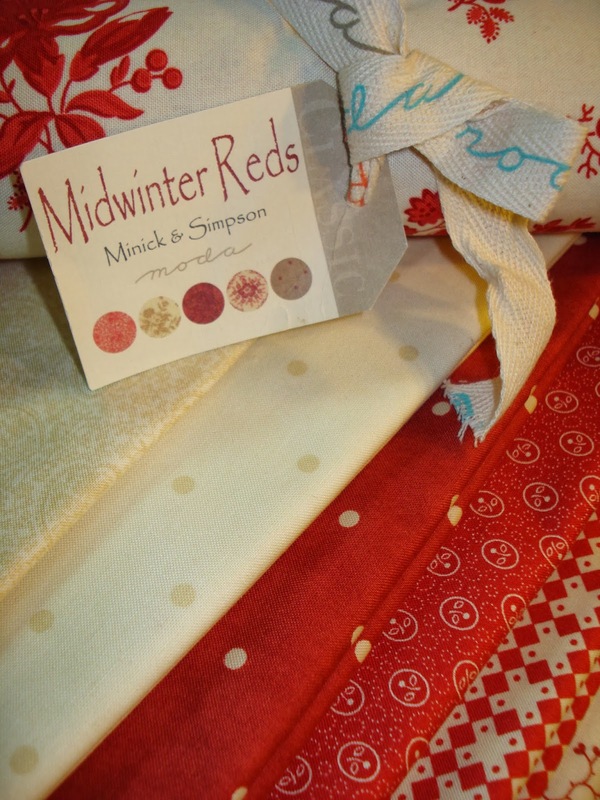 This entry was posted in Home Decor, Moderate and tagged Errata, Midwinter Reds, Mini Quilt, Minick and Simpson, Sipiweske Quilts.